The body normally functions to control the intake of glucose into the cells. In normal cases, insulin is supplied endogenously in order for the body to get the much needed glucose into the cell and out from the bloodstream, but the normal physiology of the body can be disrupted every once in a while. Because of the diet that people have and their lifestyle, it is common nowadays to see cases of diabetes. Type II Diabetes is the type of diabetes that develops insulin resistance to the cells. There are a number of symptoms that people experience whenever they have a dysfunctional system that pertains to the control of the blood sugar. In type II diabetes, one of the most common signs is uncontrolled weight loss and whenever the person’s blood is taken, there are instances of hyperglycemia. Normally, you would want to get your blood glucose level within 80-120 mg/dl. But because of the fact that resistance is present during type II diabetes – unlike Type I diabetes where production itself is limited – it is expected that the glucose is found in the bloodstream rather than in the cells. Two of the worst complications of diabetes are DKA and HHNK. There are striking disparities between these two diseases when it comes to pathophysiology and other aspects. DKA is called diabetic ketoacidosis and is one of the deadliest complications that one can experience in diabetes. On the other hand, HHNK, which literally means hyperosmolar hyperglycemic non-ketoacidosis or simply non-ketoacidotic coma. The similarity between HHNK and DKA is the fact that both are potenitally life threatening and should be managed as soon as possible. DKA is caused by the shortage of insulin. It happens both in type I and type II diabetes. Whenever the body feels that there is a shortage of insulin, it burns the stored fat in order to compensate; however, the problem is ketoacidosis. The most common cause of this disease is non-compliance with insulin therapy. The symptoms of DKA are ketone bodies present in the blood with a high blood glucose level. Upon interview, or upon observation, it is common to see a patient that is excessively thirsty and with a ‘fruity’ odor on the patient’s breath. To treat DKA, it is important to supply the body with the much needed insulin in order to solve all the other problems. On the other hand, HHNK is a medical emergency more commonly seen in type 2 diabetes mainly because of dehydation. It could be caused by an infection. In these cases the underlying cause of infection should be treated while simultaneously continuing hydration therapy. The significant difference between the DKA and HHNK can be found in the absence of ketosis in HHNK unlike in DKA. DKA and HHNK are both medical emergencies and are both seen in diabetes patients. DKA occurs with the presence of ketosis while HHNK has no evidence of ketoacidosis. DKA is commonly treated with insulin therapy while HHNK’s dehydration is the first thing that is treated together with attention to infection. DKA have a fruity odor in the mouth due to ketone bodies, something that is not present in HHNK. John J. "Difference Between DKA and HHNK." DifferenceBetween.net. May 31, 2018 < http://www.differencebetween.net/science/health/disease-health/difference-between-dka-and-hhnk/ >. Type I diabetes is not Diabetes Insipidus. D.I. has to do with the body’s “unwillingness” to let go of water. 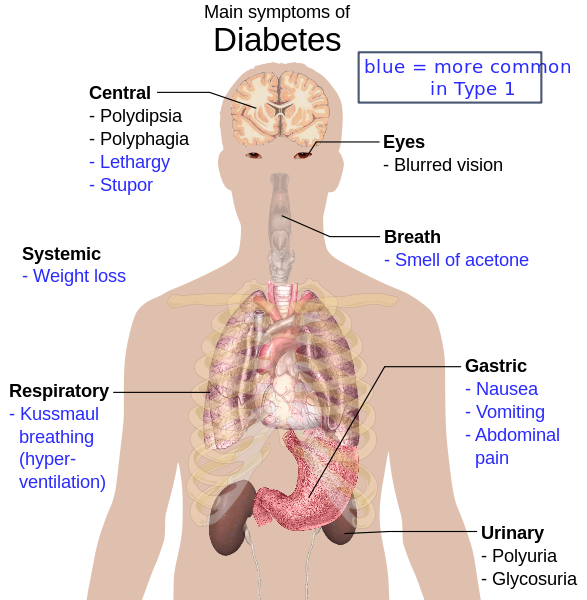 Type I and Type II are both diabetes mellitus (which is Latin for honey or sugar). Excuse me, I meant “willingness”. SIADH would be an increase in anti-diuretic hormones thus preventing the body from releasing water. D.I. is a lack of ADH. There is not enough specific information to give a completely accurate discription of either HHN or DKA.